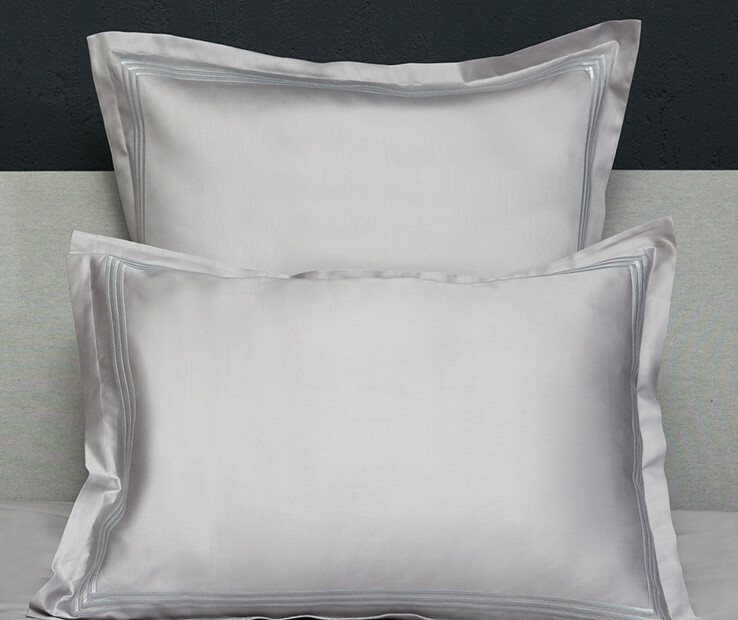 The Platinum Sateen Sham reinterprets the traditional three line embroidery with a more contemporary style in both the shape and the use of the color combinations. 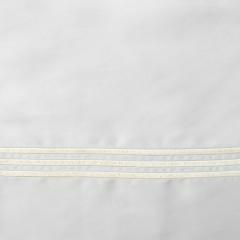 Varying colors of the embroidered lines are matched to the diverse colors of our 300 t.c Sateen Raffaello collection. The elegance in its simplicity and the bliss in its color perfectly blend to create this collection, quintessence of the Made in Italy label. Made with the sublime Signoria Egyptian combed cotton 300 t.c. 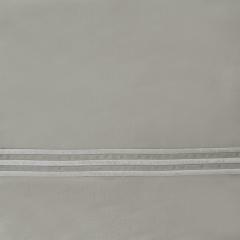 sateen, the Platinum Sateen shams have small 1 inch flanges and three embroidered lines on the bag of the sham. Available in Standard, Euro and King sizes. 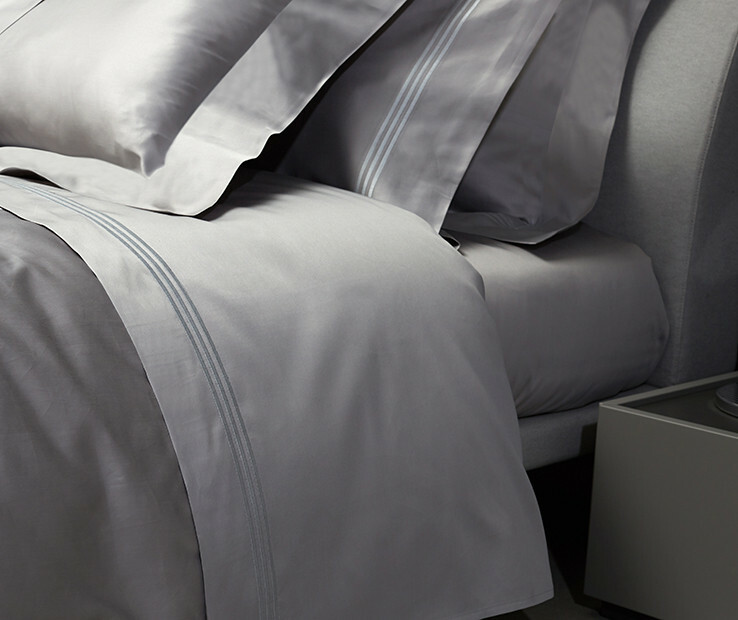 The Platinum Sateen Duvet Cover reinterprets the traditional three line embroidery with a more contemporary style due to the use of the color combinatios. 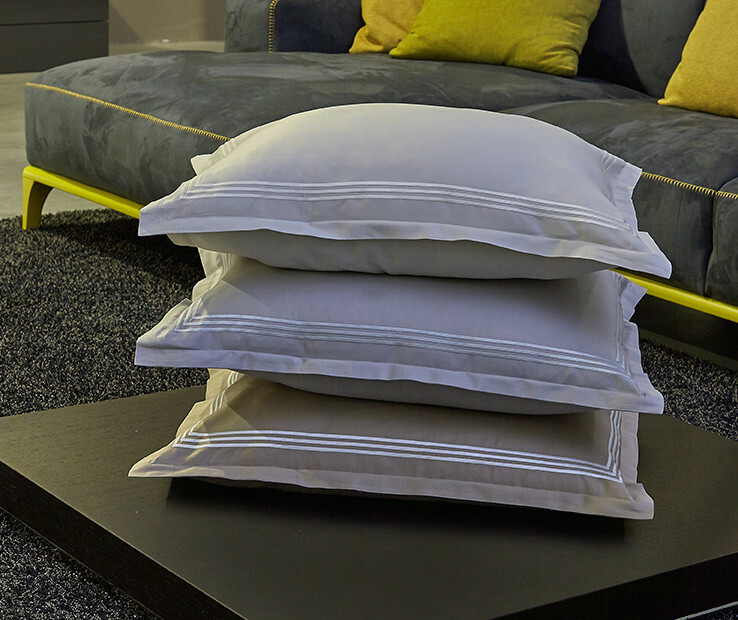 Varying colors of the embroidered lines are matched to the diverse colors of our Raffaello collection. The elegance in its simplicity and the bliss in its color perfectly blend to create this collection, quintessence of the Made in Italy. Made with the sublime Signoria Egyptian combed cotton 300 t.c. sateen. 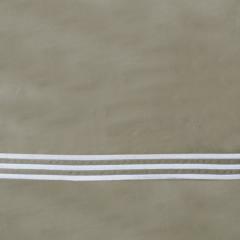 The three line embroidery forms a U shape on the top side of the duvet cover. Available in Twin, Queen and King sizes. Buttons closure. 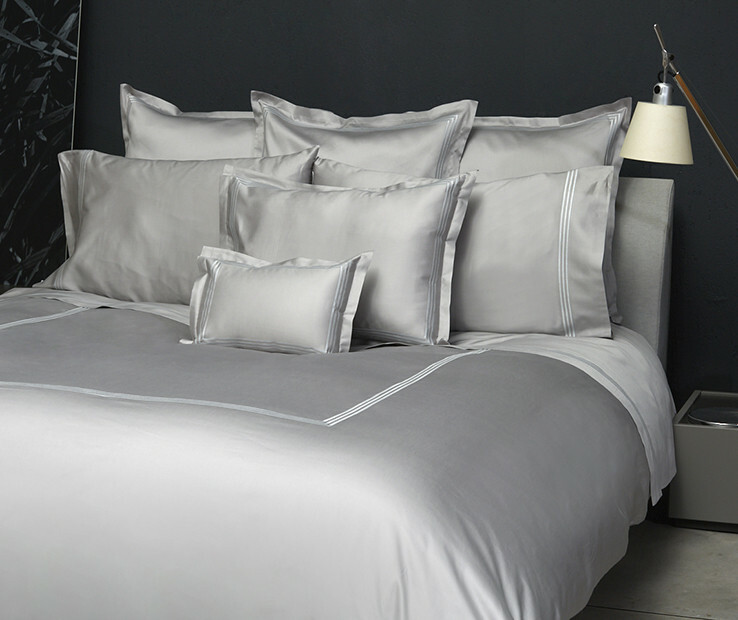 The Platinum Sateen Flat Sheet reinterprets the traditional three lines embroidery with a more contemporary style due to its use of color combinations. Varying colors of the embroidered lines are matched to the diverse colors of our Raffaello collection. The elegance in its simplicity and the bliss in its color perfectly blend to create this collection, quintessence of the Made in Italy label. Made with the sublime Signoria Egyptian combed cotton 300 t.c. sateen. Available in Twin, Queen and King sizes. 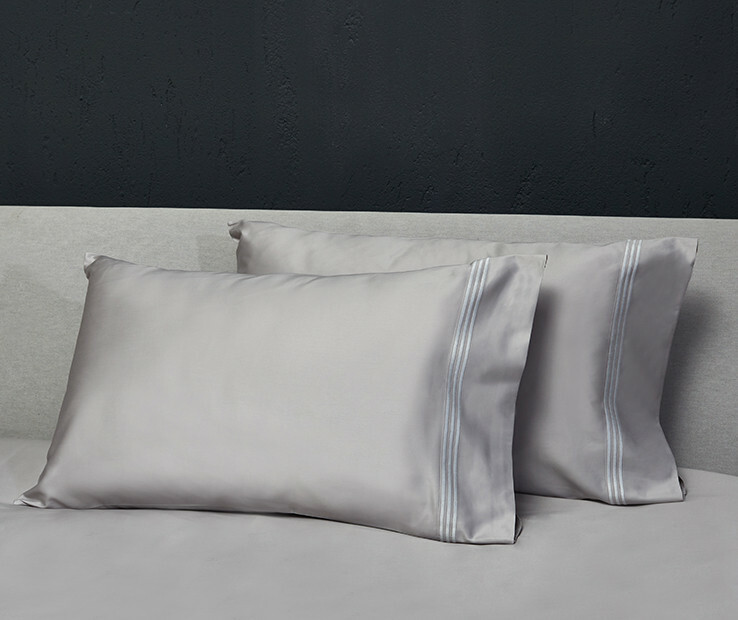 The Platinum Sateen Pillowcases reinterpret the traditional three line embroidery with a more contemporary style due to its use of color combination. Varying colors of the embroidered lines are matched to the diverse colors of our Raffaello collection. The elegance in its simplicity and the bliss in its color perfectly blend to create this collection, quintessence of the Made in Italy. Made with the sublime Signoria Egyptian combed cotton 300 t.c. sateen. The set includes two pillowcases.